Two great films about love, both of them take place in Japan. One in English, one in Japanese. See both for one price, which is about 4 hours of cinema and air conditioning. If you start with the 3:15pm screening, you might get in for $7.75. A group of artists have been working on this ongoing Biennial Project, where they create art that is meant to knock the pretentious attitudes in the art world. The exhibit is on display through SAT 8/28. This park is so new, Google maps doesn't have the new image. There is a blue train caboose there! You can bad talk The Lyres; I have on an occasion or two because leader Jeff Conolly is insane. That doesn't stop him from making some of the finest garage rock of the last 30 years. Maybe he is Boston's Brian Wilson with sunglasses and farfisa organ instead of piano and sand. Stick around for the buzzing garage-rock ruckus of Triple Thick who gets extra points for having a dedicated maracas/tambourine player. The Pandemics open with a nice, fuzzy attack of their own. I'm not that wild about The Satin Kittens who are a guitar-keyboard doing stuff like Velvet Underground covers. There's plenty of room towards the back of the club if you agree with me. 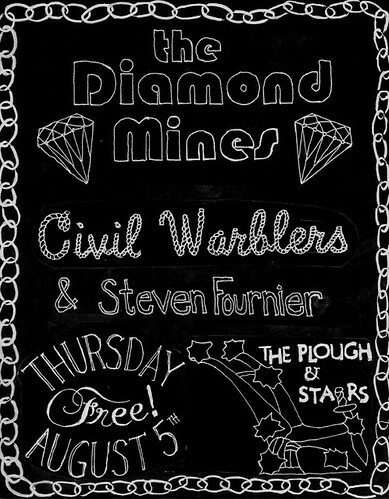 I've been a big fan of The Diamond Mines for a while, and I think I gushed about them every week of their Plough residency last year. They've stripped down to a trio, but the songs are still fantastic and the vibe is rockin'. Any night at the Plough with or without free music is fine by me.